Most Versatile Freeform Generator. This latest generation of our true flag ship machine has been proven worldwide to be the most flexible, precise, and user friendly ultra precision freeform diamond turning system available. With a minimum of three precision linear X, Y, and Z axes, the 650FGv2 is expandable to a five-axis system via optional B & C rotary axes. 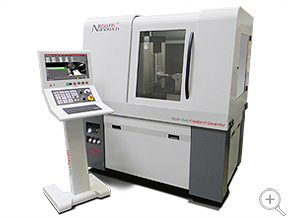 With the main work spindle centrally integrated within an oil hydrostatic Y-axis carriage, advanced machining methods such as raster flycutting of linear diffractives and freeforms, micro-prismatic optical structures, micro-milling of aspheric lens arrays as well as Slow Slide Servo (S3) machining of toric, biconic surfaces are achievable. A high speed 64 bit Delta Tau PowerPMAC Motion Controller with the Nanotech's own touch / swipe gesture HMI, NanoSMART. Three customizable 22" wide screens are accessible by swiping left or right from the main screen. 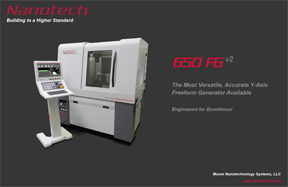 Ability to handle 5GB program file sizes, 4X faster processing speeds, remote diagnostics and a leading 8 picometer feedback resolution combine to make the new Nanotech 650FGv2 the most user friendly high performance multi-axis diamond turning system available. We welcome you to experience the difference for yourself! This machine uses the same FEA optimized base structure as our 450UPLv2 , but with the major difference of a vertical oil hydrostatic Y-axis within which the main work spindle is symmetrically integrated. The 650FGv2 features independent hydrostatic oil bearing box style slide ways on X, Y, & Z linear axes with linear motor drives that provide dynamically stiff and well damped motions. Our athermalized spindle mounting technique combined with a standard closed-loop chiller with temperature controlled solution circulating around the motor and bearing journals, enhances long term thermal stability of the system. This ideal center mounted thrust plate design, engineered for both heavy loads and high throughput applications, includes the exclusive added durability benefits of porous graphite. Motion accuracies are guaranteed to less than 12.5nm throughout its 10,000 rpm speed range with total liquid cooling for long term thermal stability.